It only took three years but it would cool to see what kind of new comp would turn up. Are we able to change anything else about him? Like voice or colour of the mummy outfit? What so Algol can be naked but DJ can't? What kind of oppression is this? I imagine voice would be okay. Colors have problems. All black on Cervantes stage hrrrnnngggghhh. I think there are precedents for allowing character recolors in tournaments (that is, people picked recolored characters that were on the system and there were no complaints). Players won't usually have time to mess around in CaS during tournaments, so the selection of recolors is pretty much limited to what's already there. Even if there is a recolored character, stage selection remains random, so there's only a 1 / however-many-stages-there-are chance of getting Cervy's stage. The human eye is very good at picking out motion irrespective of coloration, so the benefits of being black on a dark stage are dubious. Thunderdrums and dresses are the real problem, since they obscure the animations. Oh hey, look, it's what I suggested from the very beginning. How about making him Ninja default but color his 1P red and 2P blue? 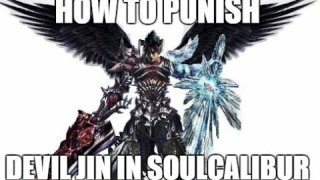 That or utilizing Jin DLC? I kinda wish they would use this as a tourney legal Devil Jin CAS, it stays within Devil Jin's default height and it doesn't require DLC, but I kinda understand why they would just go with just mummy thing since it only takes 2 seconds and I guess in the long run I could deal with just using the default mummy CAS. Also for anybody wanting to pick up DJ, heres some combos for you. I figured that one of the premade costumes like Ninja would be used and possibly recoloured once for a P1 and P2 but hey inclusion's inclusion, I guess. @Donutman are you going to NEC? Are there any other acceptable deviations from the Mummy DJ?